With Christmas just around the corner, families everywhere are starting to put into their DVD players all of their favourite holiday-related films, from Elf to The Snowman to Arthur Christmas to whatever incarnation of A Christmas Carol you can think of (even St. Vincent). In cinemas, however, the Christmas-themed choice seems to be between Nativity 3 and Get Santa – right away, we can say that one of them is significantly better than the other, and given what film this review is focusing on you can probably guess which one. If you haven’t for some reason, Get Santa is a Christmas film that certainly captures the spirit of goodwill and joy associated with this time of year, and although it’s definitely rough around the edges its heart is definitely in the right place. Much of that has to do with Santa himself, played here by Jim Broadbent. His is an exceptionally entertaining Father Christmas, packing the heart and warmth you’d expect from the man but with a few twists here and there that make him a little unique but still identifiable. You rarely see the actor simply playing Santa Claus, but rather Santa Claus himself – that’s an impressive feat especially when taking on such an iconic character. The naivety and innocent nature of his Santa is what makes most of the comedy work here, especially when he’s locked up amongst fellow, more dangerous criminals. For instance, the moment he pursues a hardened persona as “Mad Jimmy Claus”, strutting down the prison corridor in slow-motion with his hair freshly-braided and N.W.A’s “Straight Outta Compton” blaring on the soundtrack (which, by the way, is as awesome and hilarious as it sounds), he blows it when he spots who he assumes is someone or something also associated with Santa and unknowingly insults them. However, it’s never portrayed as being thoroughly mean or threatening; instead, the film even manages to find the Christmas spirit when it’s behind bars with these roughened types. 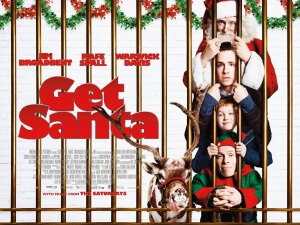 The best scene in the whole movie is when Santa addresses his fellow convicts about their childhood dreams which he has full knowledge of, and it’s so wonderfully written and wonderfully acted with Broadbent leading the charge that you wish the whole movie was just this. 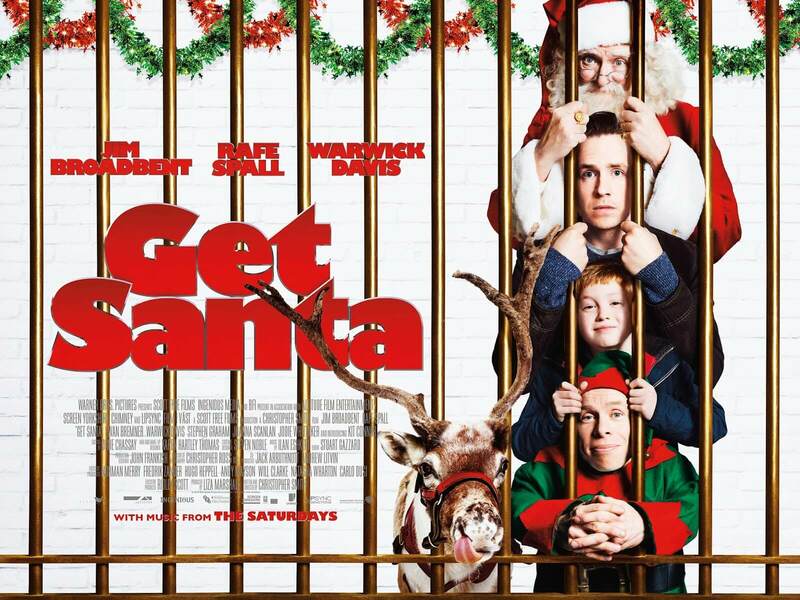 Unfortunately, it isn’t – the bigger crux of the story, and where most of the action takes place, is the journey taken by Rafe Spall’s ex-convict and his young son (a debuting Kit Connor) to find Santa’s reindeer and sleigh in order to spring him from prison. Spall’s scepticism mixed with Connor’s optimism is cute at first, but can become a little tiresome after a short while, and while the performances by both are fine their chemistry feels a little off and it’s hard to fully buy them as father and son. Mix in farting reindeer and an interesting but disgusting use for reindeer droppings late in the third act to please the children, and it’s a portion of the movie that is passable but nowhere near as good as the parts with Broadbent’s Santa in them. As a family film more so aimed at children than adults, there are a few contrivances that may irritate older members of the audience. For example, you can bet that there would be a bit more, erm, “authority” from prison guards as they contain their prisoners – but then again, it’s doubtful you could see bludgeons being used to a certain degree in a children’s Christmas film anyway, so we’ll let that one pass (but just barely). In addition, most of the supporting players are one-note and very simplistic – you can tell right away that Joanna Scanlan’s parole officer is the villain because of her icy nature and pet toad which she keeps in her office (yeah, why not? ), and Jodie Whittaker’s only contribution to the whole thing seems to be her worrying for the safety and well-being of her child, like we haven’t seen that from her before (oh, that reminds us; Broadchurch is starting up again on ITV soon…). However, the biggest problem of all is that the film doesn’t end on a very strong note. A goal is accomplished, and that’s it. It just cuts to black and the credits start to roll. You’re taken aback by how abruptly it concludes, but even more so when you realise that there are at least half a dozen things that hadn’t been wrapped up. There is a minor plot thread hinting at Santa’s past as an ex-con, but it’s never developed or comes back in any way; there is a news report that Australia is waking up on Christmas morning with no presents in their stockings, yet the film never shows us how it’s all fixed so we’re left to assume that they’re screwed; and without giving anything away, a number of characters have broken quite a few laws to get to this point but we do not see the consequences, if any at all, with the police. Were they going to prison, which seems most likely? Does Spall fully reconcile with his son and family? Will the rest of the world get their presents in time, and therefore experience part of what makes Christmas so enjoyable for children? We have absolutely no idea, because the film ends before it even considers those questions. It’s extremely frustrating and unsatisfying, and leaves you feeling a little empty as you exit the auditorium. But if one thinks back to what makes it work, especially Broadbent’s Santa, then Get Santa is a fine Christmas distraction if you’re headed out to the cinema with your kids. At the very least, it’s got to beat seeing Nativity 3, right? Get Santa is a problematic but good-hearted Christmas movie, with Jim Broadbent’s warm portrayal of Santa being the highlight, and a frustrating and incomplete ending being the lowpoint.